Studying and Living in Canada - StudyinCanada.com! Now that you’ve applied to pursue your undergraduate degree in Canada, there are a few things to consider before you arrive. It is never too early to start thinking about accommodation in your first year at university. 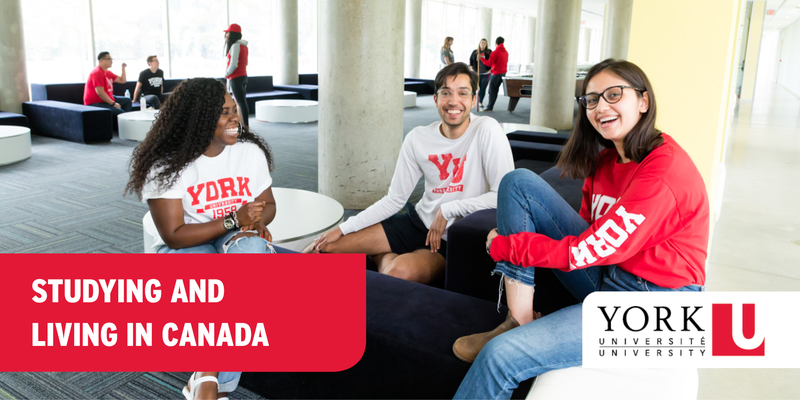 York University has close to 2,500 residence spaces available for students in ten different undergraduate residence buildings at York’s Keele and Glendon campuses. Below we will go over the residence options at York, as well as the application process. Living on residence is an excellent way to get involved in the York community. Being on campus means that you are close to your classes, campus amenities like restaurants and shop, as well as steps away from a subway station that will connect you throughout the city of Toronto and beyond. Most York University residences are arranged in a traditional style with single and double bedrooms sharing common washrooms and lounges. At the Keele Campus, we also have some suite-style residences with in-suite kitchens and washrooms, typically shared by two or six students. Normally, first-year students will share a double room with a student of the same gender. All first-year students admitted for the Fall session directly from a full-time secondary school program are guaranteed residence. Now that you know you’re guaranteed a room in residence as a first-year student, it’s time to apply! There is a formal application that must to be filled out to be considered for a place in residence. On the application, you will be asked a variety of questions to place you in the residence that best suits your needs, as well as match you with the most compatible roommate(s). Many students opt to select a residence preference based on their Faculty program of study. You can also select based on proximity to classes and other campus amenities. Remember, every residence will offer a great first-year experience and support system as you make the transition to university life! You are required to pay a $300 non-refundable room offer deposit online using a credit or visa debit card upon acceptance of your residence room offer. Your deposit is not an additional charge and will be deducted from your room fees after you move in. If you have any other questions about residence at York University, look through our list of frequently asked questions or contact us on Twitter or Facebook. See you in September!